Myles Taylor practices business law and litigation, including contract claims, partnership and corporate issues, fraud, tortious interference, and professional malpractice. He is also experienced in trust and estate disputes and elder abuse cases. Myles has represented both plaintiffs and defendants throughout California in state and federal courts and in arbitration. He has successfully handled complex cases from inception through trial and appeal, including with damages ranging into the multiple millions of dollars. Myles also works with small and mid-sized business and entrepreneurs to form companies, draft contracts, operate their businesses lawfully, and protect their trademarks. He has supported clients across a wide range of industries, including retail and e-commerce, biotechnology, real estate and development, financial services, entertainment, agriculture, cannabis, and food service. 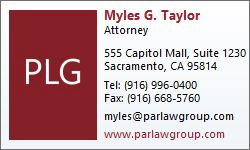 In 2018 and 2019, Myles was designated a “Top Lawyer” in the Sacramento Magazine. Myles is admitted to practice law in all California state courts and the U.S. District Court for the Eastern, Northern, and Central Districts of California. Myles earned his Juris Doctor with distinction from the University of the Pacific, McGeorge School of Law, where he was Chief Articles Editor of the McGeorge Law Review. During law school, Myles published an article on attorney ethics and technology and worked for the Hon. Kimberly J. Mueller at the U.S. District Court in Sacramento. Myles previously graduated from the University of California, Davis with a Bachelor of Arts in political science.